It’s very important to know the role of chords in a track, for understanding the track. Here I’ll show you examples of chord progression analysis of two tracks. Tonic is written as T, dominant is D, and subdominant is SD. 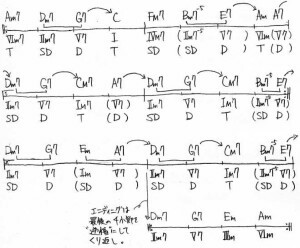 “Cherry” is composed of only diatonic chords like this. It’s impressive we can make enjoyable and exciting movement with just only diatonic chords. 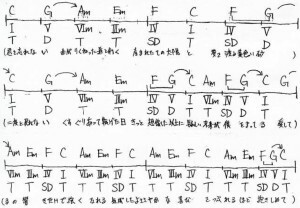 E7 in the 7th bar is not diatinic chords of C key. This is “two-five progression” built with thinking Am in 8th bar (It’s VIm in the track) as temporary Im. There are some other similar place. You can see, this track has a lot of “two-five progression”. Check it out, “temporary two-five progression”.